A few musician friends have recently asked me about hearing protection. At the age they're approaching, their hearing is starting to decline naturally anyhow. But they're also starting to realize they might want to protect what's left of their hearing. At this point, it's almost certainly too late for them, and they've sustained permanent damage, in some cases serious. It's sad - these people who love sound and work with it can't enjoy it anymore. Science and medicine still don't know a whole lot about how exactly your ears work, although their are some interesting theories. More importantly, it means we can't really fix broken ears. If you have bad eyes, you can get glasses or contacts or even have frickin' lasers shot at your eyes or cataract surgery, and within a few hours, you can see about as good as anyone. If you break your ears, well, tough. 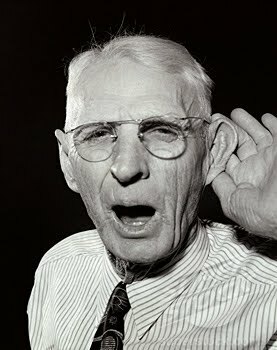 Our best solutions these days are smaller, louder, electronic, better versions of those giant horns old people used to hold in their ears. But they don't really bring beautiful, clear, great sound back. You can't get your ears corrected like you can with your eyes. Whenever I have a chance to teach, I always tell students if they only remember one thing, it's this: Protect your hearing. Please. Loud sounds, for long periods of time can permanently, irrevocably damage your hearing. The louder the sound, the less time you have to be exposed to it before permanent damage occurs. If you've ever been to a show and had your ears ringing afterwards, congratulations: you probably damaged your ears a little. The great hearnet.com site has several resources and lots of helpful (if depressing) information, including a chart that shows 30 minutes in a dance club, or 7.5 minutes of a typical band practice are enough to put you at risk. Wear ear plugs whenever you're going to be around loud sounds. I carry earplugs with me everywhere. I wear them, without fail, at band practice, at shows, at clubs. Even at loud parties or events. My heuristic (or hearistic!) is if I have to shout to be heard, I probably need earplugs. What do you want out of earplugs? You want 'em to offer "flat" attenuation at a reasonable price, and you want them to be comfortable to wear for long periods of time. "Attenuation" refers to how much the earplugs "turn the volume down". You don't always want maximum attenuation. You want appropriate attenuation. The "flat" part refers to whether or not the earplugs affect the balance of frequencies as they turn the sound down. You can just plug your ears with your fingers, for example, and attenuate a LOT. But you lose way more of the high frequencies than the low frequencies. My current favorite and preferred pair are the V-Moda Faders/Ear Armor. These do a better job of attenuation than the Etymotic plugs, and I find them to be more pleasant in terms of frequency response. Though they are metal and heavy, I find them to be very comfortable. 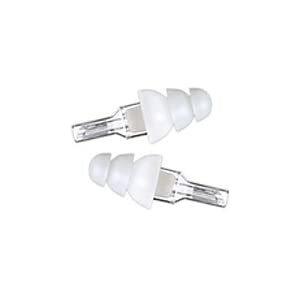 They also look like you're wearing in-ear monitors, because they're fancy and come with a cord to tie them together. I keep a pair of these with me at all times. They're also affordable and come in different colors, if you care about those things. I have a few pairs of these. I got some for my wife. My friend Sid bought these for everyone in his band. Etymotic ETY earplugs are close enough to flat frequency response and fit pretty well. I wish they attenuated a bit more, but one advantage is they're cheap enough that when you lose them, you don't freak out. Despite their being really, really light, I also find them to be only comfortable for an hour or so, and then I want to take them out. Your ears are different from mine, so fit and comfort are going to be subjective. The good news is these are all relatively affordable things to try. Keep trying until you find something you like. Foam: Sure, If Nothing Else. 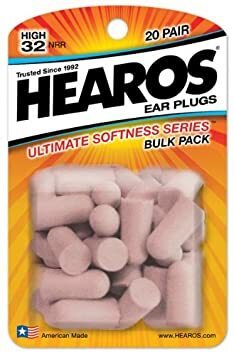 Always have a box or bag of the construction/foam earplugs handy for your friends, relatives, visitors...and yourself if all else fails. They're not flat by any means, rolling off tons of high end. But they are cheap, easy to carry, and attenuate like crazy (if you get the thick ones). If they get sweaty or lost or worn out, you throw 'em away and you're out a few pennies. There's no reason not to have a ton of these lying around. I've tried various pairs of "custom fit" earplugs over the years. For most of these, you go to a doctor or facility, and they squirt plastic into your ears to create a custom mold. There are some new technologies that supposedly allow you to do it yourself at home, but for a proper, guaranteed fit you need a professional to supervise. These are supposed to be the best. You get pretty close to flat attenuation, and often different filters you can snap in to adjust how much attenuation you get. But the custom fit stuff has never really worked for me. Aside from fit problems (if I chew or drink), they're expensive and hard to acquire. And the resulting protection has never been as good as advertised. And when I lose them, I get pissed because they were expensive and time-consuming to acquire.